Leaders in structural steel fabrication & erection. Based in Rockhampton, Queensland, Pierce Engineering is a locally-owned and family-operated company with a long history of delivering successful projects to satisfied clients. Their large modern workshop is capable of handling the largest to the smallest of projects, and is fully equipped with machinery for construction and repair. That facility – combined with more than 45 years of industry experience – makes them a leader in steel fabrication and erection. Pierce Engineering’s extensive history began in 1967 when it was founded by Noel Pierce. Since then, the company has been passed on to the second generation of Pierce owners – Noel’s sons Wayne and Mark – who have led the business to continued success. 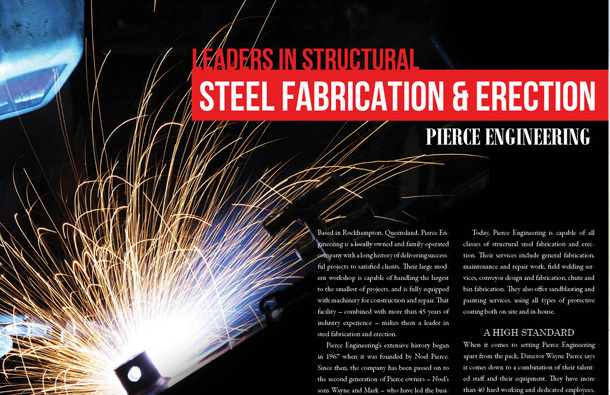 Today, Pierce Engineering is capable of all classes of structural steel fabrication and erection. Their services include general fabrication, maintenance and repair work, field welding services, conveyor design and fabrication, chute and bin fabrication. They also offer sandblasting and painting services, using all types of protective coating both on-site and in-house. When it comes to setting Pierce Engineering apart from the pack, Director Wayne Pierce says it comes down to a combination of their talented staff and their equipment. They have more than 40 hard-working and dedicated employees, a management team with more than 150 years combined and their welding facilities and milling machine facilities are stocked with an array of modern equipment. They also have a new environmentally-friendly sandblasting painting booth, which they spent $1.5 million constructing. That facility allows the company to paint in a controlled environment, no matter what the weather conditions are outside. It was built to stand up to the environmental regulations imposed by the Rockhampton council, who inspect it every six months. “Not a lot of fabricators in Rockhampton have that,” Wayne says. From a staffing perspective, Wayne adds that Pierce Engineering is also set apart by employing their own rigging crews – something that not a lot of companies in their field can claim to do. “We have our own cranes and riggers, and all our own equipment, so we can do the complete job,” he says. That commitment to doing a “good, complete job” has enabled Pierce Engineering to forge strong and long-lasting relationships with their customer base. The company’s competitive price points also help in that arena. “The price has always got to be right, but we pride ourselves on doing a great job, and we set a pretty high standard,” Wayne says. Pierce Engineering has relationships with certain clients that go back decades. Their internal relationships, with their employees, are even stronger. Some of their workers were hired by Wayne’s father, and have been with the business for more than 25 years now. Even more have been with the company for 10 years or more. One employee has actually been with the company 40 years. Wayne places a high value on that kind of employee longevity because it proves that Pierce Engineering has a positive and productive corporate culture. That internal experience is also reflected in the high quality work they deliver, as well as the efficiency in which they deliver it. Pierce Engineering also boasts similarly positive relationships with the people on their supply chain. Once again, they have been using the same suppliers for decades, and the relationships that Wayne’s father forged in the early days of Pierce Engineering are still going strong. Companies like OneSteel, Metalcorp, Stramit, Blastech, Industrial Galvanisers and Lysaght have all been faithful partners since the company’s start. Over their many years in the industry, Pierce Engineering has successfully completed numerous high profile projects all over Queensland. In Mackay, for instance, they were part of the team that delivered the Conservatorium of Music, and in Gladstone they contributed to the Mater Hospital. They have also worked on hospitals in Barcaldine and Maryborough, in addition to various other substantial projects in Cairns, Townsville, Gympie, Mt Isa, Longreach, Blackhall and their home in Rockhampton. One project that stands out to Wayne is the Rockhampton Airport, which Pierce Engineering worked on when it was first established. He also singles out Rockhampton Saleyards, the new Rockhampton Library, and the Rockhampton Hospital redevelopment as works that he’s particularly proud of, and best exemplify what Pierce Engineering is capable of. Moving forward, Wayne says he wants to keep winning and completing those kinds of landmark projects. That doesn’t necessarily mean growing, however – they are currently happy with the size of their staff as it suits the current economic climate. In Wayne’s long-term vision for Pierce Engineering, he simply sees them continuing to do what they have been doing for 45 years now – keeping up with the latest technology and machinery, keeping prices down, and delivering quality projects.